The Panasonic Auto Extension AVC Software automatically tracks the height of the product while welding, which may occur due to heat distortion of the workpiece. For MIG welding this function is particularly useful for the welding of eccentric pipes, large workpieces or for Hard facing and Wear Buildup applications. For TIG welding this function is useful for many applications to ensure that the arc length is maintained, including Pipe work and for Hard Facing applications. 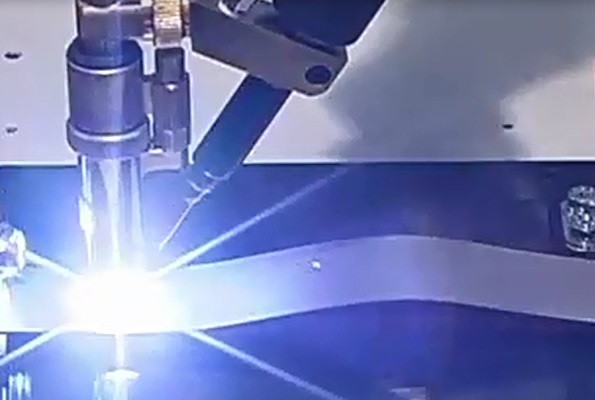 For the TIG welding of the distorted workpiece as shown in this image, the system completes a height check to determine the optimum distance from the electrode to the workpiece prior to establishing the arc. Once welding the robot tracks the torch up or down to maintain the optimum electrode to workpiece distance. This software is available on Panasonic TAWERS robot welding systems.